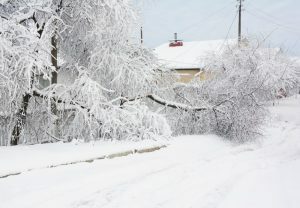 In a normal winter, the weather talk is about never-ending snow accumulations and too cold temperatures. But this winter has been anything but normal. Instead of snowpocalypse” and “snowmageddon,” the weather reports have been filled with “bomb cyclones,” “nor’easters,” and other wet weather terms sounding completely made up. Whatever you choose to call it, the wet weather has been relentless this winter and the result has been flooding and water damage in homes throughout various regions. Burst pipes are one common root of winter flooding. However, when it comes to natural causes, winter flooding may occur when freak warm days cause all the snow to melt quickly. The water needs somewhere to go, and what the ground can’t absorb due to over saturation could be headed for your home. This year rains have increased water levels of melted snow, followed by freezing temperatures, only to be followed by more rain. Yards began to resemble small, homemade ice rinks. And because a sheet of solid ice stood between the ground and the standing water, the water had nowhere to go…except for maybe your basement. 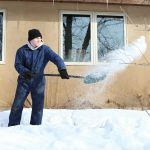 If your basement or other area of your home took on water this winter, your misery certainly had company this season, as many residents dealt with similar situations. And because the cold weather is far from over, it’s possible this wintery snow/rain/ice mix could be a repeat situation. Snow piles, frozen ground, and sheets of ice leave little opportunity to fix the problem by working outside first. Instead, a good defense may stand as your only option for a good offense. Use the following list to stock your home and properly respond when winter water makes its way indoors. Clear snow away from your home. Even if you’re landscaping and surrounding land is properly pitched to send water away from your foundation, if the groundwater levels are too high near your home, you may still have water seep in. Remove large amounts of snow to areas where your foundation will be less affected, and if possible to do so without causing damage, break up ice that has formed against the base of your home. Pump the water away. It’s often recommended that homes built in flood zones have sump pumps to keep basements and other home areas dry. But what happens when you backyard turns into a pool of icy water? 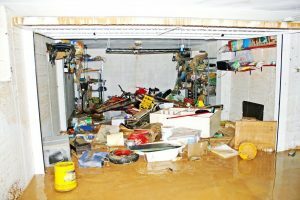 While you can’t install a sump pump there, you can bail out the water by using a submersible dewatering pump that hooks to a hose and drains to an area that won’t cause further damage. Until the warm weather of spring hits, take these steps to reduce the damage caused by winter flooding. If the water rises to an unmanageable level, we’re happy to help dry out your home and restore your life back to pre-flooding conditions.